Bhaktivedanta Academy for Culture and Education (BACE) is an organization oriented towards training youth in moral and spiritual valued based on the timeless principles of Bhagavad-Gita Srimad Bhagavatam and the Vedas. BACE also has extension centers next to institutions to cater to the need of youths. (Students) can also reside together. Each centre is like a mini temple, complete with alter, morning program, kitchen, sanctified food ,book distribution, reading room, well equipped library of books and audio& video tapes, accommodation for staying and visiting students and most importantly systematic spiritual education. This is to train students in the application of philosophy, values and principles in their personal life. The students of the BACE rise early morning of about 4 am, take bath, and assemble for Mangal Aarti followed by Mantra Meditation. Thus they get the wisdom of one in eighties only when they are eighteen. The Morning Program gives them the cheerfulness and serenity that brings forth concentration in all activities of the day as well as mature behavior. Students also learn etiquettes, manners and proper behavior to be followed while living in society. They learned how to deal with equals, juniors, seniors, elders in the family, parents and teachers. They also learn how to act in different situations, be the easy or difficult. Through training various qualities like integrity, truthfulness, simplicity, honesty, trust worthless, no enviousness, maturity, humility, freedom from false pride and many similar qualities are imparted. These form a solid foundation of character in their life. Vibrant health, peaceful mind, satisfying loving relationships are essential for life of quality. Almost everyone could live healthily for a century if he just followed a life of plain living and high thinking. For many reasons, however people live unhealthy lives and die prematurely. People poison their digestive tract with meat, alcohol, and various chemicals used in junk-food coloring and preservation. They also poison their bodies with licit and illicit drugs, pain relievers, sleeping pills etc. The purpose of food is to increase the duration of life, purify the mind and aid bodily strength. This is its only purpose. In the part, great authorities selected those foods that best aid health and increase life’s duration, such as milk products, sugar, rice, wheat, life gets fruits and vegetables. At BACE, the serious students who follow all the regulative principles of spiritual sanctified food that is cooked in a hygienic way by devotees. It is wholesome, nutritious, satisfying and nourishing to body and soul. Yoga is meant for the reestablishment of our lost relationship with Krishna. Generally, one joins a yoga society in order to improve his health, to reduce fat. The goal of life is to realize the Lord situated within the heart of every living being. One who has no program to realize this is uselessly engaged in mock yoga practice and is certainly wasting his time. One cannot indulge in all types of sinful habits and attend a so-called yoga class and thus become a yogi. One has to practice controlling the mind, and avoiding all kinds of sense gratification. The students at BACE are serious Bhakta Yogis who live a Krishna-centered clean life that brings all auspiciousness for them and others. Meditation is becoming famous all over the world as a singular tool to alleviate stress, free one from tension, brooding tendency and inferiority complex. On the other hand, it provides one inner strength, patience, tolerance, vigor, confidence, power to make decisions, clean the heart and brings one closer to God. 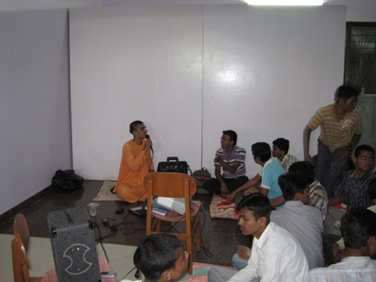 Students living in BACE or connected to BACE regularly perform a fixed number of rounds of the Hare Krishna Mantra Meditation. This helps them control their passions and harness the valuable human energy to realize God and at the same time execute their duties to parents, home and nation perfectly. Often it is thought that spiritual life is meant for the lazy or mediocre ones. The BACE students disprove these statements by flowering well in academics. For a devotee student his college studies are not material. 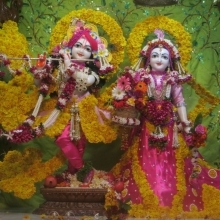 It is Krishna’s service. The students are taught most essential things for happy living without having to depend on others for every small thing – cooking, cleaning, washing, singing vaishnava songs and Hare Krishna Mantra, playing instruments like mridanga, kartals, harmonium, worshipping performing arts purchasing things from market, handling accounts, managing different departments like library, kitchen, caring juniors etc. This foundational training is greatly helpful now and in the future for the students when they have to go abroad or stay alone somewhere. Even after they get married, these talents come to help at crucial times. 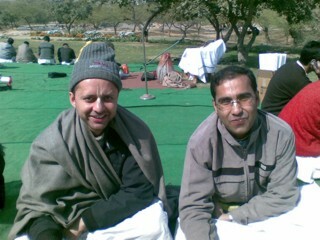 BACE also organizes spiritual trips to holy places like Vrindavan, Mayapur Dham. Jagganath Puri etc. This brings about a great jubilation to everyone. On a regular basis get together is being held by BACE where all the participants assemble and the program is filled with Group discussion, Drama, Sankirtan, Chanting and Dancing, Feasting, realization exchanges, slide shows, street harinam etc. These programs lighten their hearts and bring them close to one another. Each BACE conducts a weekly programme on a regular basis. Here presentations on various topics like ‘Art of Mind Control’ ‘Stress Management’ ‘Does God Exist?’ etc that is based on Bhagavad-Gita and Vedic literature and their relevance and applicability in modern times. Thus lot of youths is being benefited by such kind of programmes. 1) To create a facility for students to live together and practice Krishna conscious principles seriously alongside with their school or colleges studies, without the negative influences of society. 2) To establish a group of spiritually strong students who are genuine practitioner and representatives of Sanatana Dharma (Krishna Consciousness) who will be leaders of tomorrow guiding the society in spiritual life like beacon lights. 3) To train students in the philosophy of Krishna Consciousness, its universal applicability especially to the present day generation, its profound depth along with logic and reasons. 4) To develop personality and build a character of students based on the divine qualities taught in Bhagavad-Gita to give a real meaning to their lives, to live a God-Centered life of purity and dedication with love and trust amongst one another. 5) To identify the talents in students, bring out their creativity and dovetail their talents for the service and glorification of the lord. 6) To render the most noble service of “GYANA DAAN” distributing the sublime message of Vedas through spiritual books distribution at subsidized prizes for students. cassettes, OHP presentations, slide shows, dramas, charts, pictures, magazines, e-mails etc. 8) To teach how to practice the sublime pure love of God, this is the real goal of life, which alone can situate every living being back in his constitutional position of being the eternal servant of God in the kingdom of God.